Volume 2 of our Christmas collection (the "Red Book") contains ten classic Christmas carols that both you and your audience are sure to love. Be sure to also check out Volumes 1 and 3, each with 10 different carols! These holiday favorites can be played with anywhere from 1 to 7 parts, suitable for a single solo, a chamber group, a pickup group for church choir accompaniment, or a full band or orchestra (school, community, or professional). This is one of the most versatile collections you'll ever use! The audio clip has an excerpt of one carol performed as a full orchestra, a string quartet, and a woodwind duet. 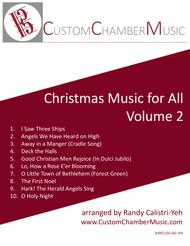 Other arrangements of these carols, as well as two other volumes of Christmas carols, are available at the publisher link above or at www.customchambermusic.com. Each carol is in its original key, so it is easy to combine these with your own choir or piano/organ parts. Each carol also includes a new original descant counter-melody to feature your soloists and add a unique sound to your performance. This collection contains full-score books for C, Bb, Eb, and F instruments, allowing players to trade parts on different verses and songs. All four transpositions work together, so you can have different instruments playing from different books. You can mix and match the parts to use it with anywhere from 1 to 7 players, and doubling the parts with other instruments you can support a full orchestra or band. Part 1: descant. This is a new original counter-melody, traditionally only played on the final verse, but you can play it whenever you want. Part 2: main melody. Remember, main melody is part 2, not part 1. Part 7: melody down 1 octave. This doubles the melody, or gives the melody to a lower instrument while all others play harmony. Duet: Part 2 and any other part. Trio: Part 2 and any two harmonies. Part 1, 2, any one harmony. Quartet: Part 2, 3, 4, 5 (standard SATB voicing). Part 2 and any three harmonies. Part 1, 2, any two harmonies. Quintet: Part 2, 3, 4, 5, 6 (full harmony). Part 1, 2, 3, 4, 5. Part 1, 2, 3, 4, 6. Part 2, 3, 4, 5, 7. Sextet: Part 1, 2, 3, 4, 5, 6 (full harmony with descant). Part 2, 3, 4, 5, 6, 7. Part 1, 2, 3, 4, 5, 7.